We investigate the reflectivity and optical scattering characteristics at 1064 nm of an antireflection coated fused silica window of the type being used in the Advanced LIGO gravitational-wave detectors. Reflectivity is measured in the ultra-low range of 5–10 ppm (by vendor) and 14–30 ppm (by us). Using an angle-resolved scatterometer we measure the sample’s bidirectional scattering distribution function (BSDF) and use this to estimate its transmitted and reflected scatter at roughly 20–40 and 1 ppm, respectively, over the range of angles measured. We further inspect the sample’s low backscatter using an imaging scatterometer, measuring an angle resolved BSDF below 10−6 sr−1 for large angles (10°–80° from incidence in the plane of the beam). We use the associated images to (partially) isolate scatter from different regions of the sample and find that scattering from the bulk fused silica is on par with backscatter from the antireflection coated optical surfaces. To confirm that the bulk scattering is caused by Rayleigh scattering, we perform a separate experiment measuring the scattering intensity versus input polarization angle. We estimate that 0.9–1.3 ppm of the backscatter can be accounted for by Rayleigh scattering of the bulk fused silica. These results indicate that modern antireflection coatings have low enough scatter to not limit the total backscattering of thick fused silica optics. N. L. Thomas, “Low-scatter, low-loss mirrors for laser gyros,” Proc. SPIE 157, 41–49 (1978). S. Chao, W. L. Lim, and J. A. Hammond, “Lock-in growth in a ring laser gyro,” in Physics of Optical Ring Gyros (SPIE, 1984), Vol. 487, pp. 50–57. G. M. Harry, T. P. Bodiya, and R. DeSalvo, eds. Optical Coatings and Thermal Noise in Precision Measurement (Cambridge, 2012). The VIRGO Collaboration, “The VIRGO large mirrors: a challenge for low loss coatings,” Class. Quantum Grav. 21, S935–S945 (2004). D. T. Wei, “Ion beam interference coating for ultralow optical loss,” Appl. Opt. 28, 2813–2816 (1989). S. E. Watkins, J. P. Black, and B. J. Pond, “Optical scatter characteristics of high-reflectance dielectric coatings and fused-silica substrates,” Appl. Opt. 32, 5511–5518 (1993). B. Cimma, D. Forest, P. Ganau, B. Lagrange, J. Mackowski, C. Michel, J. Montorio, N. Morgado, R. Pignard, L. Pinard, and A. Remillieux, “Ion beam sputtering coatings on large substrates: toward an improvement of the mechanical and optical performances,” Appl. Opt. 45, 1436–1439 (2006). G. Rempe, R. J. Thompson, H. J. Kimble, and R. Lalezari, “Measurement of ultralow losses in an optical interferometer,” Opt. Lett. 17, 363–365 (1992). F. Magaña-Sandoval, R. X. Adhikari, V. Frolov, J. Harms, J. Lee, S. Sankar, P. R. Saulson, and J. R. Smith, “Large-angle scattered light measurements for quantum-noise filter cavity design studies,” J. Opt. Soc. Am. 29, 1722–1727 (2012). T. R. Reynolds, “Ion beam assisted deposition of ophthalmic lens coatings,” U.S. patent application2011/0229659 A1 (22September2011). D. J. Aiken, “Antireflection coating design for series interconnected multi-junction solar cells,” in Progress in Photovoltaics: Research and Applications (Wiley, 2000), Vol. 8, p. 563570. M. Victoria, C. Dominguez, I. Anton, and G. Sala, “Antireflective coatings for multijunction solar cells under wide-angle ray bundles,” Opt. Express 20, 8136–8147 (2012). M. Stefszky, C. M. Mow-Lowry, K. McKenzie, S. Chua, B. C. Buchler, T. Symul, D. E. McClelland, and P. K. Lam, “An investigation of doubly-resonant optical parametric oscillators and nonlinear crystals for squeezing,” J. Phys. B 44, 015502 (2011). D. C. Massey, “Spacelab optical viewport glass assembly optical test program for the starlab mission,” Proc. SPIE 1164, 236 (1989). G. M. Harry, for the LIGO Scientific Collaboration, “Advanced LIGO: the next generation of gravitational wave detectors,” Class. Quantum Grav. 27, 084006 (2010). Advanced Virgo Baseline Design, The Virgo Collaboration, note VIR027A09 May16, 2009 https://tds.ego-gw.it/itf/tds/file.php?callFile=VIR-0027A-09.pdf . K. Somiya, for the KAGRA collaboration, “Detector configuration of KAGRA the Japanese cryogenic gravitational-wave detector,” Classical Quantum Gravity 29, 124007 (2012). B. Willke, “The GEO-HF project,” Class. Quantum Grav. 23, S207–S214 (2006). J. Aasi, and the LIGO Scientific Collaboration, “Enhanced sensitivity of the LIGO gravitational wave detector by using squeezed states of light,” Nat. 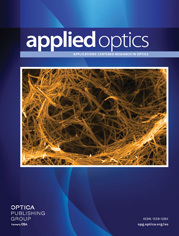 Photonics 7, 613–619 (2013). J. Abadie, and the LIGO Scientific Collaboration, “A gravitational wave observatory operating beyond the quantum shot-noise limit,” Nat. Phys. 7, 962–965 (2011). D. Ottaway, P. Fritschel, and S. Waldman, “Impact of upconverted scattered light on advanced interferometric gravitational wave detectors,” Opt. Express 20, 8329–8336 (2012). H. Luck, Max Planck Institute for Gravitational Physics and University of Hannover, D-30167 Hannover, Germany (Personal communication, 2013). J. C. Stover, Optical Scattering, 3rd ed. (SPIE, 2012). X. Chen, L. Ju, R. Flaminio, H. Lück, C. Zhao, and D. G. Blair, “Rayleigh scattering in fused silica samples for gravitational wave detectors,” Opt. Commun., 284, 4732–4737 (2011). E. Brinkmeyer and W. Eickhoff, “Ultimate limit of polarization holding in single-mode fibres,” Electron. Lett. 19, 996–997 (1983). Fig. 1. Fused silica viewport ESW03 shown in roomlight mounted on the rotation stage of the Fullerton imaging scatterometer (FIS). A laser beam is passing through both surfaces, but is not visible in the photo. The arrow indicates the forward surface. Both surfaces have identical antireflective coatings. Fig. 2. Setup for the Caltech ARS measurements. Fig. 3. Scatter measurements of the ESW-03 viewport from the transmitted (BTDF, above) and reflected (BRDF, below) sides, made using the modified CASI scatterometer at Caltech. TIS estimates are also indicated in the legend. The calibration precision for these BRDF values is estimated at better than 5%. Fig. 4. Setup of the FIS scatterometer that is described further in the text and in . Fig. 5. Upper left: Cartoon of the viewport from the perspective of the CCD camera for a scattering angle of 30 degrees. The CCD images a square 1.3 ′ ′ region that contains the front surface scattering, the back surface scattering, and the bulk scattering. Other panels: CCD images for three separate scattering angles, 20°, 30°, and 60°, showing the scattering spots on the front and back surfaces, and the bulk scattering from the illuminated volume. Fig. 6. Zoomed-in images showing the regions of interest used to capture the total scattered light (R1) and isolate scatter from the near surface (R2) and far surface (R3). For small viewing angles, such as θ s = 20 ° , shown on the left, the near and far surface scatter is highly overlapped with the bulk scatter. For wider angles, such as θ s = 60 ° , shown on the right, the near and far surface scatter is spatially separated. Fig. 7. BRDF versus scattering angle for the viewport sample. Total scatter from region R1 (squares), which includes the near surface, far surface, and bulk scatter, is in the range 2 – 9 × 10 − 6 sr − 1 . Regions R2 (right-pointing triangle) and R3 (left-pointing triangle) are centered on scatter from the near spot and far spot, respectively, and a lower limit on the BRDF from bulk scatter is estimated by subtracting R2 and R3 from R1 (circles). Dotted lines indicate the BSDF expected from Rayleigh scattering according to . The instrument signature BRDF (stars) is more than ten times lower than the total scatter. The calibration precision for these BRDF values is better than 50%. Fig. 8. Diagram of the setup used to check for the functional dependence of Rayleigh scattering intensity viewed through the side of the viewport versus input polarization angle β . Fig. 9. Imaged scattered light intensity through the side of the viewport for vertically, 20°, 45°, and horizontally polarized input light. The scatter RoI is the wide rectangle around the scattering and the background RoI is the small box at the bottom of each image. Fig. 10. Squares represent the scattering intensity ratio measured through the side of the viewport versus varying input beam polarization angle β . The dashed line is the expected intensity function for Rayleigh scattering based on measurements of Chen et al. and the cos ( β ) 2 dependency. For each image, an estimate of the background noise, produced by taking the intensity ratio in a 50 × 50 pixels region (vertically aligned with the scattering, but far below the beam in the image) and scaling it by the ratio of pixels contained in the scattering RoI to those contained in the background RoI, is marked with an x . The measured scatter matches well the sum of the expected Rayleigh scattering and the image background noise.